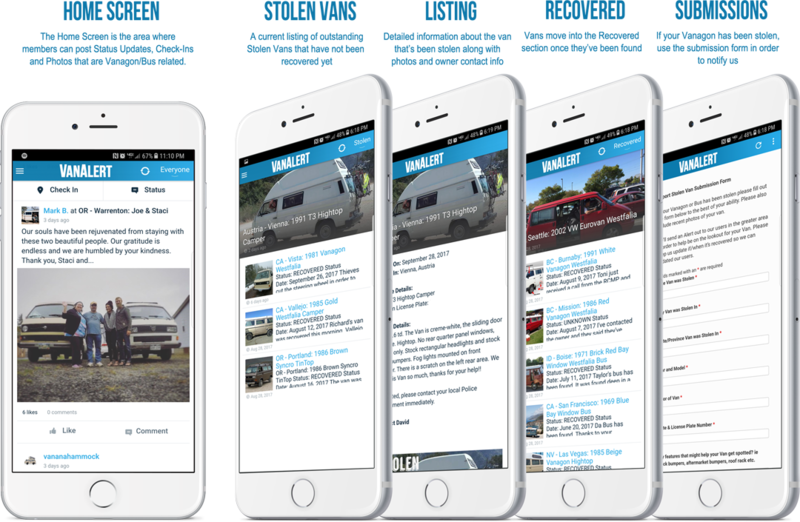 The VanAlert app is FREE to download in the Apple App Store. 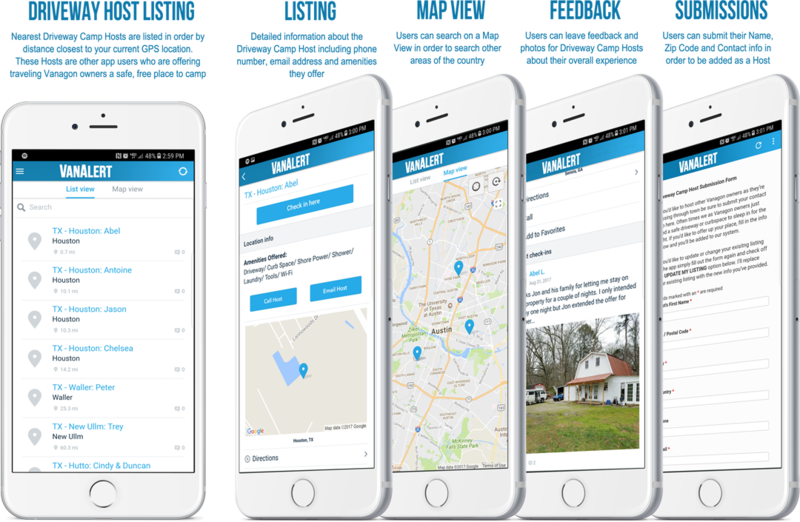 The VanAlert app is FREE to download in the Google Play Store. You can utilize the VanAlert Web App on your laptop or desktop. I've seen so many Vanagons stolen on the West Coast especially and I wanted an app that could possibly help in the recovery of said stolen Vanagon. This app allows you to report your Vanagon stolen, fill in all of the information such as city, state it was stolen in, color, and added details that may help us locate it as well as some most recent photos. 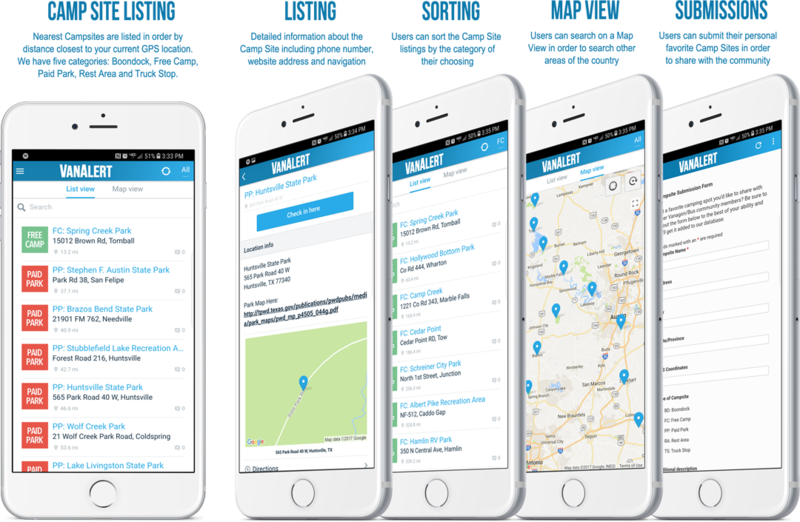 Once I receive the Stolen Van submission, I post it on our app and send a PUSH NOTIFICATION out to all of our VanAlert app users with the state that it was stolen in. This notification sends the app users to the Listing Article so they can see what Vanagon is stolen and what it looks like. They then will help keep an eye out for it in their area. This is a quick way to put out a BOLO (Be On the Look Out) amongst other Vanagon owners to keep an eye out. One of the things I've experienced while breaking down on the road is the need to find a good repair shop that has Vanagon experience. Often time people would resort to forums and social media in order to post the typical "I'm broke down in , what's a good shop nearby?". Having to post and wait for a reply is now a thing of the past. 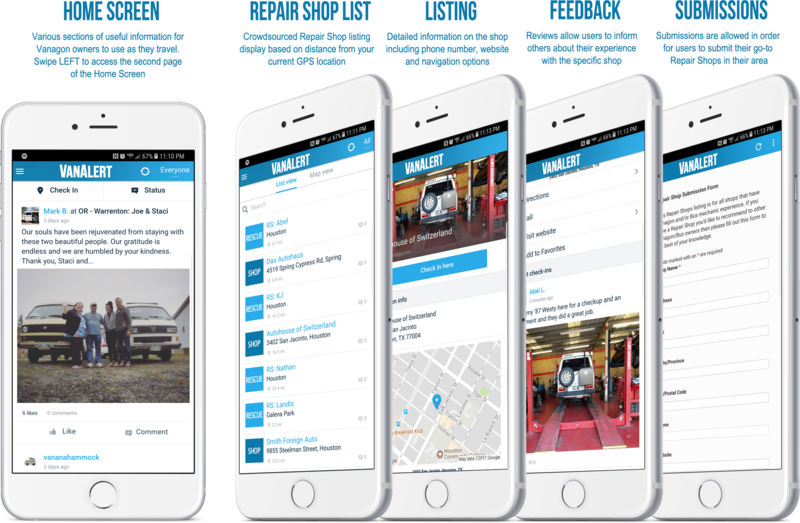 VanAlert has a crowdsourced database of reputable Repair Shops that other Vanagon owners use and recommend. So now, if (when) you breakdown, simply open the VanAlert app and select the Repair Shops icon. A listing of reputable Repair Shops and Rescue Crew entries are listed based on closest distance to your current GPS location. Now you don't even have to weed through a list in order to find a close shop, the app does it for you! Sometimes while traveling you don't necessarily need a full fledged campsite. Sometimes you just need a safe place to park for the night. That's where our Driveway Camp Hosts come into play! Driveway Camp Hosts are other VanAlert users that have volunteered to become a Host for traveling VW Vanagon/Bus owners. Hosts are listed by their generic Zip Code so when you find a Host you'd like to stay at, you simply contact them via the contact details they've provided in order to check on driveway availability and what the specific address is. 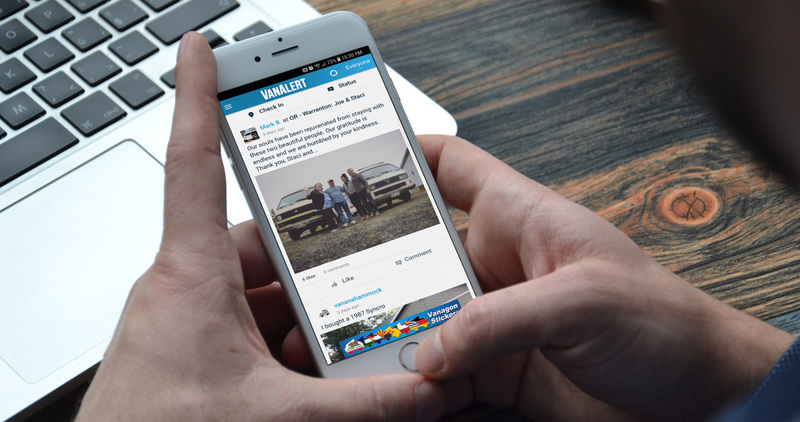 We encourage all VanAlert users to sign up to become a Driveway Camp Host. Being on the road requires needing to find a place to camp for the night. I often spent a lot of time looking at various resources including my phone, my atlas and my GPS navigation system to try to find a place to call home for the night. VanAlert will now replace all of the methods I previously used. All State Parks that allow camping will be populated in our database as well as other user submitted Camp Sites such as BLM Land camping and other locations.